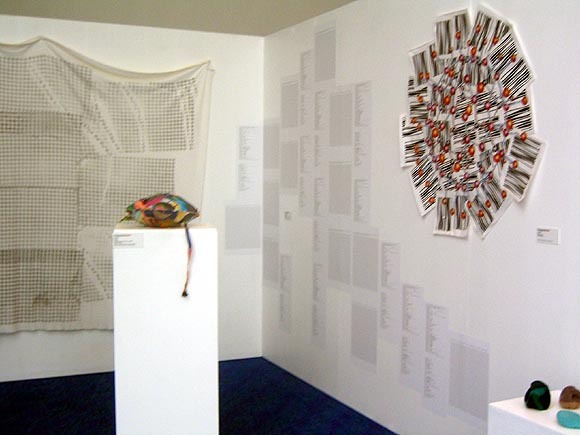 "Fuzzy Logic" show, curated by Jackie Passmore and Michael Connor for the Futuresonic 2005 festival, Manchester UK. Photos by Cat Mazza. 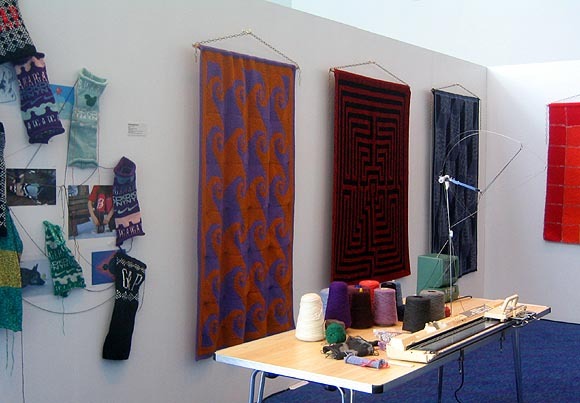 Top: Cory Arcangel's Infinite Fill Blanket, Peter Coffin's "wall-based prints bridging ASCII art and knitting patterns," a LoVid soft sound sculpture on the pedestal, my Fuzzyball paper piece upper right, and Claire Irving's mathematical knitting in the foreground. The bottom photo shows Cat Mazza's logoknit pieces and her knitting machine, and Woolly Thoughts' Mathematical Afghans.